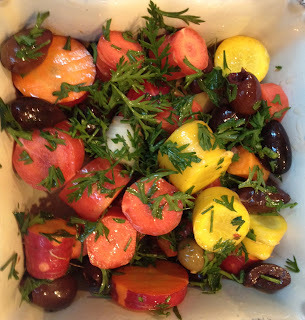 This week I have a wonderful bunch of rainbow-colored carrots, they are yellow, white, purple, and of course, orange. They were so delicious and gorgeous that I simply cleaned them up, and tossed them with some olives, a drizzle of olive oil, and chopped carrot tops (add them to salads, make tea, highly nutritious, and much too good to toss). Just make sure you only use ORGANIC ones.